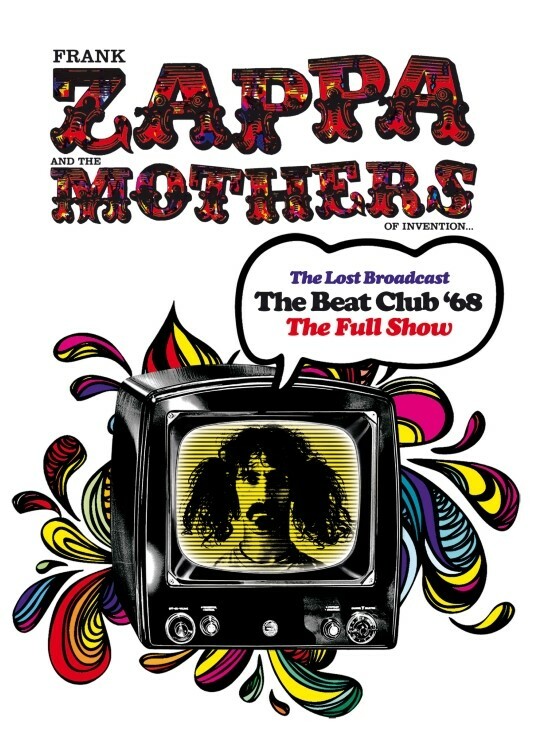 London, UK – For the first time ever, Frank Zappa and the Mothers of Invention “The Lost Broadcast: The Beat Club ’68” entire show will be released on DVD by Gonzo Multimedia in December 2015! This DVD contains a filmed rehearsal of Frank Zappa and the Mothers Of Invention at the legendary Beat Club in Bremen, Germany, on 6th October 1968. It was part of the band’s second European tour, the first having occurred a year before, although this was their first visit to Germany. What can be observed during this event is a typical rehearsal scenario, where the band is eating, drinking, tuning up their instruments, enjoying some laughs, having cosmetics applied and gradually beginning to rehearse. The music is largely one long improvisatory continuous performance rather than a run-through of their greatest hits, but occasionally Zappa directs the band into the opening themes of some of his more well-known pieces. The ensemble performs interesting renditions of “King Kong”, “A Pound For A Brown On The Bus”, “Sleeping In A Jar” and “Uncle Meat”, all of which would be included on the “Uncle Meat” album, which had already been recorded but would not be released for another six months. Also played was an instrumental version of “Let’s Make The Water Turn Black”, a version of “Prelude To The Afternoon Of A Sexually Aroused Gas Mask”, a stab at the “Prelude To Act 3 of Lohengrin” by Richard Wagner and a nod towards “Octandre” by Edgard Varese. The footage shows Frank’s use of his famous hand signals to great effect, conducting and controlling the direction of the music, instructing the musicians when to start, stop, punctuate, slow down, speed up, improvise, play in different time signatures etc. Ten days later, the Mothers of Invention were due to play at the Berlin Sportpalast. Prior to the show, Zappa was approached by students who, presumably still fired up by events the previous summer in Paris, where a revolution had almost taken place, asked him to declare his opposition to capitalism from the stage and, by extension, to further the cause of the armed and violent revolution that they believed was necessary to transform society. The students, wrong-footed by the band’s long hair, freaky appearance and reputation, assumed that an anarchic look automatically foreshadowed an anarchic attitude. Zappa, far too intelligent a man to be swayed by their ill-conceived arguments, refused. The student leaders suggested that, in that case, Frank could lend support for their cause by encouraging them to set fire to public buildings. Frank Zappa and the Mothers of Invention – The Lost Broadcast: The Beat Club ’68 (Full Show) (DVD) will be released on Dec 18, 2015.